It is interesting to show this experience with 4 enameled copper rings, on the bottom is first what I make long time before as custom order ring and now I'm trying to do the same. All have same shape, I used the same colors, but result is different. Structures, shadows and colors depends about temperature how close is torch to ring, what is temperature of flame, how thick is the coat of color and on the end - time. How long I keep torch on ring and on what distance, it is about seconds. 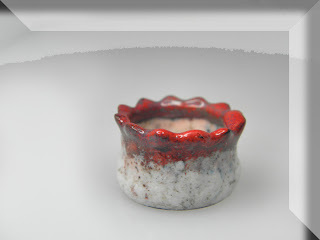 All that elements is not possible to repeat when I make enamel with torch on vertical surface as ring. Copper also has reaction with colors, change it, depends how thick is coat of colors. Although on the beginning I had intention to make same ring like first but now I like the unpredictability. I love dynamics on all surface. There is something mystic in unique shadows and structures. Thank you for posting. 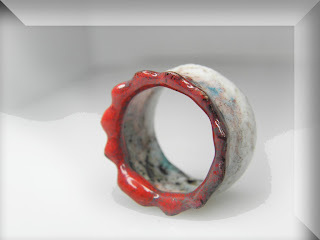 I am very intrigued with enameled copper rings. Question, do you start with sheet copper that you cut? If so, do you solder, fuse, or weld the ends of the formed ring? Or do you start with copper tube? I love your work. I also love Croatia. I was there in May and really loved the people and beautiful country. ps. I have many different types of torches and fuels. I usualle use propane to enamel copper. What torch do you use to enamel your rings. Thank you very much. May your solder flow ever so smoothly! Best regards, Shirley in Turner, Oregon, USA. Thank you Shirley for compliment! 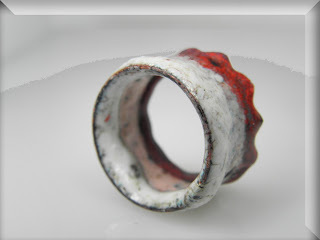 But, WOW,so many questions :) I work enameled rings from sheet, I solder ends of ring and use propane torch. Propane torch is only one torch what I have. Effects depends about distance and power of torch and some very individual details. I send you nice but warm regards from my beautiful Croatia, it is almost 40°C here and 47°C in some parts. Sorry I didn't see your nice reply. 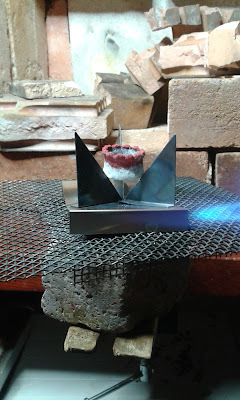 I have trouble torch enameling over solder. The enamel chips off. One more question (~_~) - what type of solder do you use. Thanks ever so much. It looks like cooler weather in Croatia.